L: 93" x W: 39" x H: 37.5"
Chadborne Leather Power-Reclining Sofa The Chadborne power-reclining sofa provides unbelievable comfort without sacrificing looks. Its genuine butterscotch leather is so soft to the touch yet durable enough to last for years. Plus, pillow arms and contoured headrests will cradle you in comfort during those long movie marathons, and Chadborne's power reclining offers infinite positions! The Chadborne power-reclining sofa provides unbelievable comfort without sacrificing looks. Its genuine butterscotch leather is so soft to the touch yet durable enough to last for years. Plus, pillow arms and contoured headrests will cradle you in comfort during those long movie marathons, and Chadborne's power reclining offers infinite positions! I just received this sofa and love seat 2 days ago. I trust Raymour and Flanigan for their quality and durability. I chose this set solely because of the beautiful "butterscotch" color as pictured on the web and in person at the store. Upon receipt of the set the color was "very" different. The color is more "brown" and not the pretty butterscotch as pictured. I would have given it 5 stars if not for the misrepresentation in the color. I will keep this darker set, but I am very disappointed. This is heavy duty and wide so be ware it may be difficult to get in narrow doors and upstaits doe to width and weight. Just purchased so can not give durability but it appears well made and is real leather as many are not. Originally, I was not after the style of this sofa, it’s comfortable without having to prop your legs up to sit back. Great back support, durable heavy leather fabric, quick response to the power reclining position looks and feels great. I promised myself I would not ball asleep on my new couch. Blew that promise! O.K, I knew I would fall asleep reclining in it. Unfortunately, I laid down across it, and was out cold in 5minutes! I have 8 1/2 foot ceilings on three floors of a 110 year old home. I must admit, it's a lot heavier than it looks, and there was a sharp left hand turn to navigate. These professionals did it in 30 minutes. I'll be using my tax refund to purchase my kitchenette set from Raymour and Flaningan. It is a very nice sofa. Real leather feeling and smell. Pro: very long, I am 6'2'' and i can lie down on the sofa from head to toe to rest and sleep. The delivery is easy, I paid full delivery and they deliver to my room. Con: The new sofa has some sort of leather smell. But all leather product has it. I think it will go away soon. After much searching for just the right recliner that didn't look like a recliner, we choose this couch . It is amazingly comfortable and the leather is to die for, we loved it so much that we purchased the remaining furniture in this collection. Just gorgeous. We chose the Butterscotch because it is a beautiful color. Bell, who helped us and everyone at the store in White Plains were extremely helpful. Very happy with our purchase. I really love my new furniture. The only reason I gave it 4 stars is the color is much darker than I expected. It’s closer to the brown family than a butterscotch. Other than that I love love love it. This is a beautiful reclining sofa! The color is what I was looking for. The leather is soft and the sofa itself is very very comfortable!! The reclining feature is definitely an extra bonus! Stunning piece!!! Sofa, love seat and chair are perfect. Looks exactly as pictured. It is truly a beautiful piece of furniture! Recently I came by the store and saw the Chadborne Leather reclining chair making me fall in love with it. I asked the sales person about it had any other pieces matching the same and she showed me the couch and loveseat. I immediately felt for the same for it's stylist design, material durability, smooth and rich color. Once I got them home everyone was ecstatic about the same. I truly love them! Just purchase the Chadborne Sofa and Loveseat it'a a bit pricey but i absolutely love it. This collection is gorgeous. When I walk into my Livingroom I smell the scent of Leather. This is a beautiful sofa-arrived in perfect condition and is very comfortable. The Chadborne leather power reclining sofa is made well. They are comfortable and most importantly my significant other loves the color and the reclining motion of the sofa. Thank you for making such an amazing furniture. My husband really wanted a reclining couch for our living room. I was scared we would end up with a giant couch with cup holders. We found this couch and it for both our needs! It’s comfortable yet trendy. Very happy with our purchase. My dog loves it too! Does the middle seat of the couch recline? BEST ANSWER: The middle seat does not recline. Does the leather fade in color over time? BEST ANSWER: We have had ours for a few years now. No fade. It's a real quality piece and the leather is durable. We are really happy with ours even taking kids abuse. Would buy again and the color is unique but fits well with many decor situations. Took delivery in May 2018. Hasn't faded yet. Loves the sofa! No - purchased my couch in mid 2017 and still looks new. Took in May 2018. Hasn't faded yet. Loves the sofa! For those who have had this couch/love seat for at least a year, how are the cushions and arms holding up? Have they flattened out much or do they still have the same shape/density? BEST ANSWER: Everything is still like we just bought it yesterday. Both pieces are use heavily. Shape is like brand new also not a dent in the density. Love it. We bought a lot since we've been married 2007. Everything from RF. I just wish we could afford to get rid of bedroom set we spent a lot of money for them they are crap. Which makes me sad. Thanks Robert! Good to know about the furniture keeping it's shape after 2 years. Sorry about your bedroom furniture though. I'm actually looking for a bedroom set too. I wish I did more research on it but I bought it for my wife with her input. So we had everything delivered livingroom n bedroom right after we got married. We've had our furniture for 2 yrs now. The cushions on the top look a bit crooked because the kids jump on them but the seat and arms are perfectly in place and fluffy So far they are in great shape and worth the $$$$. Our couch receives lots of wear..it has held up very well..no flattening or change of shape. Is this natuzzi natural or protecta leather? BEST ANSWER: Hi Stephanie, thank you for your interest in the Chadborne Leather Sofa. This sofa is made with Protecta leather. 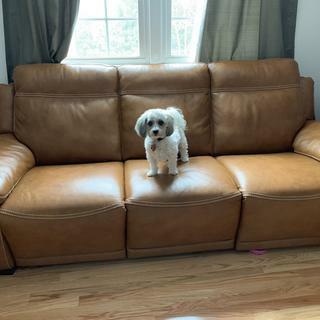 I purchased the sofa and love it but what is the best way to care for the leather? Do you need to use a leather conditioner on it? 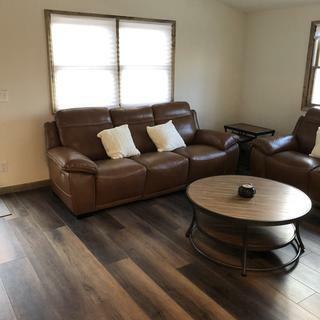 what color coffee table and end table coordinate with this couch? BEST ANSWER: A butterscotch color coffee table and end table will coordinate well with this couch. Can the sofa be purchased without the reclining seats? BEST ANSWER: The Chadborne is available as a reclining sofa only. 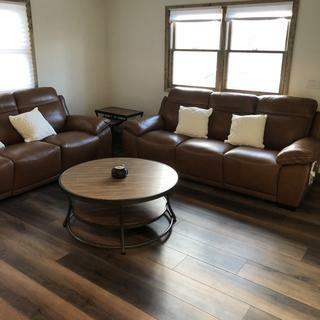 Which country Chadborne Sofa is made? BEST ANSWER: The Chadborne collection is made in China. Can this be ordered in another color like black? Is the head rest adjustable? BEST ANSWER: The head rest is not adjustable. Does the Platinum Protection Plan start day one or begins after the warranty? BEST ANSWER: The Platinum Protection Plan begins the day you accept delivery of your items.